Cubitron II wheels are put to the test in this case study. The grinding/abrasives market is rapidly changing, thanks to new technology, more flexibility and an attempt to lower customer costs. Productivity is at an all-time high in this market, and it’s only going to improve with further R&D. By the time IMTS 2014 rolls around this September, the gear market will have lots of new toys and gadgets to offer potential customers. If you haven’t upgraded any grinding/abrasives equipment in the last five years, now might be a good time to consider the investment. Environmentally friendly, highly efficient and lasting a product's lifetime. With characteristics like this, Pulsed-Plasma Diffusion (PPD) technology from Oerlikon Balzers has established itself as an industry standard for the treatment of large automotive press tooling. Now the technology specialists are targeting new applications with this advanced process, offering an alternative to traditional hard-chrome processes. New technology from Eldec/EMAG helps control the induction hardening process. The heat treatment processing of powder metal (PM) materials like Astaloy requires four steps -- de-waxing, HT sintering, carburizing and surface hardening -- which are usually achieved in dedicated, atmospheric furnaces for sintering and heat treat, respectively, leading to intermediate handling operations and repeated heating and cooling cycles. This paper presents the concept of the multi-purpose batch vacuum furnace, one that is able to realize all of these steps in one unique cycle. The multiple benefits brought by this technology are summarized here, the main goal being to use this technology to manufacture high-load transmission gears in PM materials. Precision components (industrial bearing races and automotive gears) can distort during heat treatment due to effects of free or unconstrained oil quenching. However, press quenching can be used to minimize these effects. This quenching method achieves the relatively stringent geometrical requirements stipulated by industrial manufacturing specifications. As performed on a wide variety of steel alloys, this specialized quenching technique is presented here, along with a case study showing the effects of prior thermal history on the distortion that is generated during press quenching. Dressable vitrified bond CBN grinding tools combine the advantages of other common tool systems in generating gear grinding. Yet despite those technological advantages, there is only a small market distribution of these grinding tools due to high tool costs. Furthermore, scant literature exists regarding generating gear grinding with dressable CBN. This is especially true regarding the influence of the grinding tool system on manufacturing-related component properties. The research objective of this report is to determine the advantages of dressable CBN tools in generating gear grinding. Part I of this paper, which appeared in the January/February issue of Gear Technology, described the theory behind double-flank composite inspection. It detailed the apparatus used, the various measurements that can be achieved using it, the calculations involved and their interpretation. The concluding Part II presents a discussion of the practical application of double-flank composite inspection -- especially for large-volume operations. It also addresses statistical techniques that can be used in conjunction with double-flank composite inspection, as well as an in-depth analysis of gage R&R for this technique. Every so often manufacturing is jolted out of its inertia by a transformative technology – one that fundamentally changes not only the way products are made, but also the economics of the business. The complete product news section from the March/April 2014 issue, featuring quick-change spline rolling racks from U.S. Gear Tools. The complete technical calendar from the March/April 2014 issue of Gear Technology. 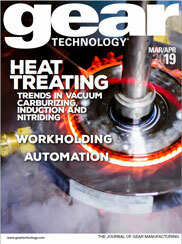 The complete Industry News section from the March/April 2014 issue of Gear Technology. Blogging is BIG and getting bigger all the time. There doesn’t exist, for example, a news, industry, or entertainment entity that does not have at least one resident blogger. And now, since January -- we have ours.